“Standing Room ticket holders may stand behind the last row of the main floor, or the last row of the top balcony. 200 Standing Room tickets are available for each performance starting at $10 each, cash only. Tickets go on sale at the Opera Box Office at 10am on the day of each performance. Limit 2 per person. 50 tickets are held for sale 2 hours before the performance. Often, when the line of eager standees is let loose into the opera house, it’s literally a mad rush, not unlike the crazed Cabbage Patch shopping dashes decades ago. Once at their chosen spot, each person sets a jacket or program on the railing, especially if they’re going to walk away from it before curtain, to ensure it’s there when they return. Sometimes tempers flare a bit, if someone starts to elbow into a spot clearly too small for a standee, or moves one of the jackets or programs. On the whole, the standees are some of the most faithful, committed and knowledgeable aficionados. Who wouldn’t be to stand for 5+ hours at a Wagner opera, for example? 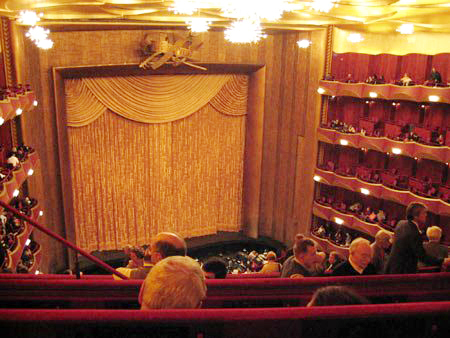 During a ’92 design internship in NY, I did standing room for the very first time, at the Met. It was Zeffirelli’s loved and loathed Turandot, starring Gwyneth Jones’. From the Family Circle, it seemed I could nearly touch the ceiling, which looked an awful lot like dozens of upside-down, gilded baby pools!!! Students (presumably) sat off to the sides, at lit stations, studying scores as the performance progressed. At some point, I walked down and sat on the side hallway staircase, enjoying the echoes and resonance of the performance from a sort of sound tunnel. In this Family Circle, you literally feel as if you’re peering down from the heavens. However, even with that distance, Dame Jones still managed to pierce my ear-drums with the sort of sword-like tone opera lovers long for these days. It was thrilling…a true olympic feat of vocal technique and stamina. On a tour of the Wiener Staatsoper (in ’95), we were ushered through their legendary standing room, and told about a whole set of protocol and etiquette I don’t recall the details of. The primary space itself was like an oversized opera box, with multiple rows that standees would file into, as if in the maze-like line for an amusement park ride. However, that memory is overshadowed by the policy which the guide shared about no women being allowed to play in the orchestra. Only female harpists were hired (because good male harpists were scarce), but even they were shrouded from the audience’s view by a curtain. I was completely incensed by this, and when I inquired the guide defended it as honoring tradition!? Thankfully, I believe this “tradition” has been lifted since. 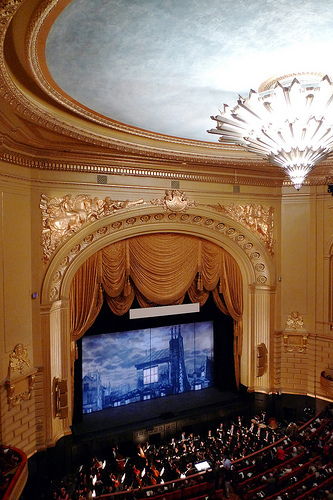 With the economy being as it is, standing room is a more desirable option now than ever…although I also perform as a Supernumerary in SFO productions, which offers the cheapest and closest view of all! Aside from the price and acoustics, there is something very old-school about being a standee that makes me feel young(er) again, as if I’m filled with wonder, and back discovering this beloved performing art for the first time again. It’s satisfying in its austerity, in a way that a $250.00 ticket couldn’t be! It offers a pleasure too, in that sense of getting something special for next to nothing (ie: finding a cute pair of designer jeans on the sale rack, etc.). That being said, when I’m not doing yoga, my back does complain a bit more than I’d like, and I’m a fidgeter, which is even more tempting in these conditions. The two most common excuses from my peers as to why they don’t attend opera is that it costs too much, and that they don’t/won’t understand it. Well, standing room is only $10 (or so, depending where), AND with Supertitles, that second excuse is nixed…SO, start lining up people!! !